First water cooling, now electric motors; purists take heed. 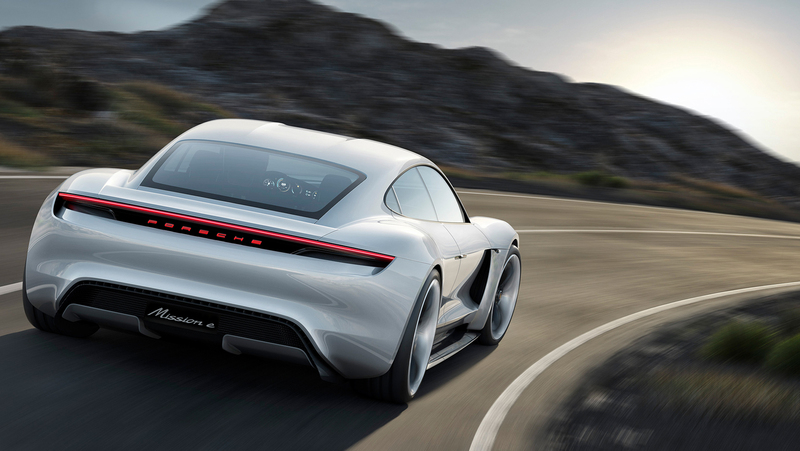 Porsche has confirmed that its Mission E concept car (originally shown at the Frankfurt International Motor Show in September) will be put into production and launched in the next four years. Dr. Wolfgang Porsche, Chairman of the Supervisory Board of Porsche AG said that the Mission E is “a clear statement about the future of the brand”. Porsche traditionalists can’t really get up-in-arms about the brand producing an electric car however, as Ferdinand Porsche developed the first electric hybrid car in the early 1900’s; but I’m sure they’ll have something to say. With members of the motoring press still bemoaning the switch to electric power steering in 911’s, I can’t imagine the switch to an electric power plant being an easy decision for Porsche to make. However with the recent move to turbocharge all 911’s bar the GT3, the marque is clearly focussing on lowering their fleets’ CO2 emissions in the coming years to meet ever tightening Euro emissions laws. The Mission E produces proper Porsche power and acceleration figures, with a claimed 440kW and a zero to 100km/h sprint of just 3.5 seconds. Range is claimed to be more than 500 kilometres, but I would half that if you’re impressing your mates with the previously mentioned performance figure. There’s more than a hint of Aston’s Rapide in the Mission E’s styling, which is no bad thing. Thankfully there’s no similarity to Porsche’s other ‘estate’. Porsche claims that the lithium-ion battery packs, which are incorporated in the Mission E’s floor, can be recharged to 80 per cent charge in less than 15 minutes via their 800-volt charger unit which has been specially developed for the car. Or if charging cables aren’t your thing you can have a wireless induction charger set-up in your garage floor to charge the car automatically when you get home. Say what you will about electric cars but you have to admit that Porsche has nailed the stying of the Mission E. The concept has to be one of the best looking four doors since the launch of Aston’s Rapide and it will be interesting to see how much of this stays put as the car moves from concept to production. The Mission E has a fully functioning interior which leads one to think that the brunt of development work has been completed. One of the most interesting things I hope makes it into production is the sliding front quarter panel that moves to reveal the car’s charging status. 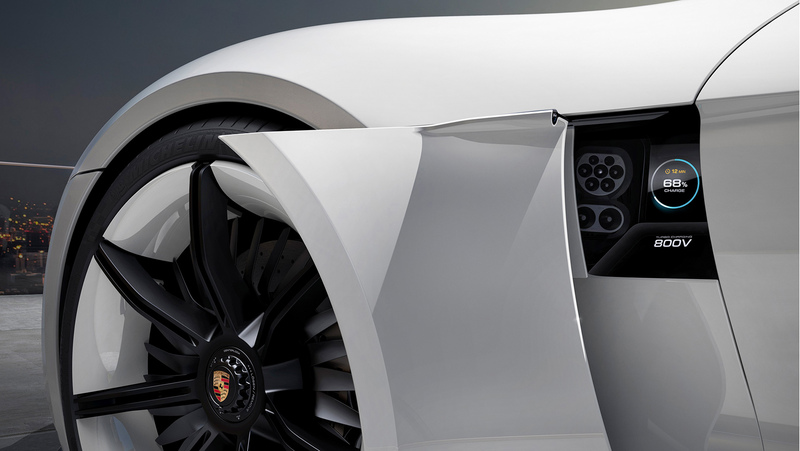 A section of the front quarter panel in the concept car slides open to easily access information on the car’s charging status. Will it make production though? As always with electric cars, the biggest concern is range and charge time. Porsche’s claim of a 15 minute, 80 per cent charge is a good start and if its wireless induction charging system could be integrated extensively then there’s a real chance that electric cars could be the future. 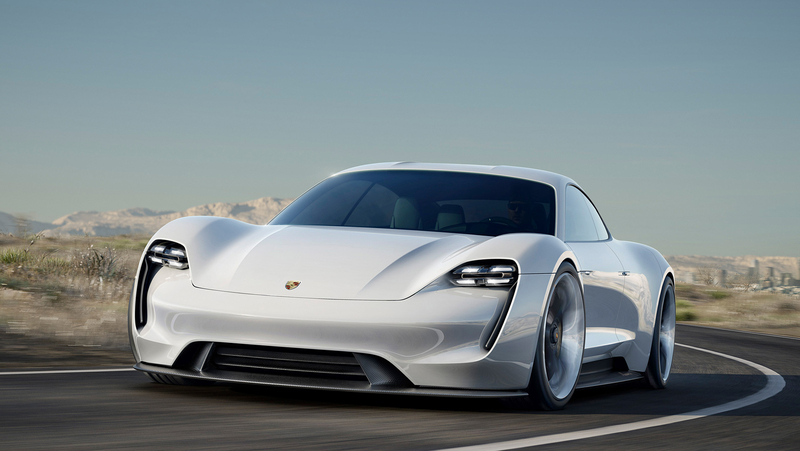 With a set release of “this decade” as long as charging and battery technology continues to advance at the rate is been, the Mission E might actually be a viable future for the brand just as Dr. Wolfgang Porsche suggests.